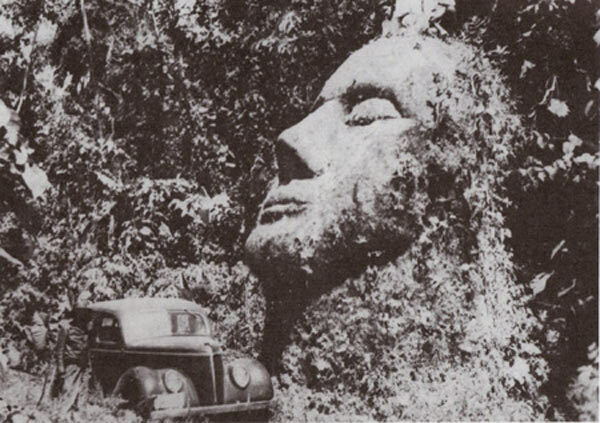 Over half a century ago, deep in the jungles of Guatemala, a gigantic stone head was uncovered. The face had fine features, thin lips and large nose and its face was directed up at the sky. Unusually, the face demonstrated Caucasian features which were not consistent with any of the pre-Hispanic races of America. The discovery rapidly attracted attention, but just as quickly it slipped away into the pages of forgotten history. News of the discovery first emerged when Dr Oscar Rafael Padilla Lara, a doctor of philosophy, lawyer and notary, received a photograph of the head in 1987 along with a description that the photograph was taken in the 1950s by the owner of the land where the head was found and that it was located “somewhere in the jungles of Guatemala”. The photograph and story was printed in a small article in the newsletter ‘Ancient Skies’, which was picked up and read by well-known explorer and author David Hatcher Childress, one of our guest authors at Ancient-Origins.net, who sought out to discover more about the mysterious stone head. He tracked down Dr Padilla who reported that he found the owners of the property, the Biener family, on which the monolith was found. The site was 10 kilometres from a small village in La Democracia in the south of Guatemala. However, Dr Padilla said that he was in despair when he reached the site and found that the site had been obliterated: “It was destroyed by revolutionaries about ten years ago. We had located the statue too late. It was used as target practice by anti-government rebels. This totally disfigured it, sort of like the way the Sphinx in Egypt had its nose shot off by the Turks, only worse,” he said. The eyes, nose and mouth had completely gone. Padilla was able to measure its height as between 4 and 6 metres, with the head resting on a neck. Padilla did not return again to the site due to armed attacks between government forces and rebel forces in the area. However, far from helping the cause and the investigation into the monolith, this publication only served to have the opposite effect, throwing the whole story into the hands of a justifiably sceptical audience who thought that it was all just a publicity stunt. Even the letter itself has been drawn into question with some saying that it is not genuine. Nevertheless, it appears the giant head did exist and there is no evidence to suggest the original photograph is not authentic or that Dr Padilla’s account was false. So assuming it was real, the questions remain: Where did it come from? Who made it? And why?
? 11 Ways To Change Your Definition Of Life And Attract Positive Energy One Of The Most Important Videos You Should Watch ?